Identifying immunological factors that determine disease outcome. 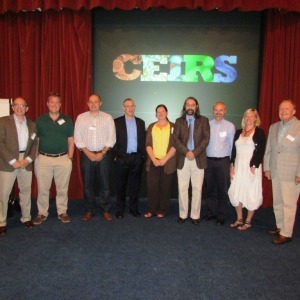 From left to right: Dr. John Treanor, NYICE; Dr. David Topham, NYICE; Dr. Richard Webby, SJCEIRS; Dr. Richard Rothman, JHCEIRS; Dr. Diane Post, CEIRS Project Officer; Dr. Adolfo García-Sastre, CRIP; Dr. Andy Pekosz, JHCEIRS; Dr. Stacey Schultz-Cherry, SJCEIRS; Dr. Richard Compans, Emory-UGA CEIRS. Not Pictured, Dr. Walter Orenstein, Emory-UGA CEIRS. 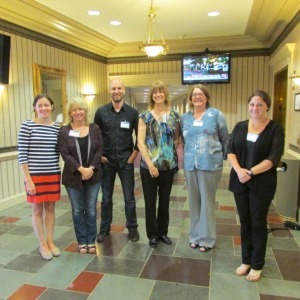 From left to right: Melissa Uccellini, PhD, CRIP; Pam McKenzie, PhD, SJCEIRS; Ryan Camping, CRIP; Donna Neu, PMP, NYICE; Tanya Cassingham, Emory-UGA CEIRS; Lauren Sauer, MSc, JHCEIRS.